Do you really want to "get away from it all" ? Why not escape to a rugged, unique and unspoiled Island ? Dursey Island lies just off the South West Coast of Ireland, at the end of the Beara Peninsula in West Cork. The island is reached by the Dursey Island Cable Car which takes you out over the Atlantic Ocean, over the Dursey Sound, and safely onto the island without getting your feet wet, or getting into a boat !! It is Europe's only cable car traversing the sea. 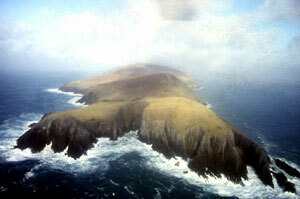 What else is so special about Du﻿rsey Is﻿land? No people... just 3 permanent inhabitants. Peace and utter tranquillity - the only sounds are those of birds, farm animals and the crashing waves of the sea. Spectacular sea views - looking out to the Bull Rock (and its Lighthouse), Cow and Calf Rocks ,the Skelligs and the wild Atlantic Ocean. Prehistoric and early history ruins and sites - a monastery ruin and burial ground from the 16th Century, a signal tower from Napoleonic times, a standing stone, the Needle's Eye, the ruins of a temporary lighthouse, a fulacht fiadh from the Bronze Age, Eire stone markings from World War Two and other antiquities. It is one of the highlights of the Wild Atlantic Way. Its unique features make the island an absolute paradise for Walkers, Artists, Writers, Musicians,Photographers,Composers,Poets, Nature-Lovers, Historians, Astronomists (the neighbouring peninsula is a Dark Sky Reserve) or for those who just "want to escape from the madding crowds" !!. Birdwatchers .The main attraction for birdwatchers coming to Dursey Island is twofold: firstly, with the Bull Rock offshore (and its big Gannet colony), there are thousands of seabirds to be seen including not only Gannets but also Manx Shearwaters, Guillemots, Razorbills and Puffins: in addition, the island itself hosts breeding Choughs. Secondly, during the migration season, the island has attracted many migrants including some rare migrants from the west (including birds from North America such as Wilson's Warbler and Ovenbird), the east (including birds from Siberia and the Far East such as Eastern Olivaceous Warbler and Red-flanked Bluetail) and the south (including birds from Southern Europe such as Hoopoe and Bee-eater). "Dursey Island remains one of the top birdwatching sites in West Cork, if not in Ireland.........just don't tell anyone ! " Sea Angling/Shore Angling . Due to it's deep water, and treacherous tides and currents, Dursey Sound is renown for some of the finest Sea/Shore angling in this part of the world. The shoreline , on the island side, just under the cable car pylon is a sea anglers euthopia ! Whale Watching . The waters off the west of Ireland provide one of the most important breeding and feeding grounds for Cetaceans in Europe, due to the upswell of nutrients form the Continental Shelf. Due to its panoramic view of the Atlantic , Dursey Island provides one of the best locations on the western seaboard to view Whales (Baleen,Fin,Minke and Humpback) Dolphins (Bottle-nosed and Risso), Porposises,Seals and the occasional shark (Porbeagle and Basking) ! It was the national school for the island for more than 90 years and you can read a brief history in the 'History of the Schoolhouse' tab at the top of the page. It stands alone on the hillside and is the highest building on the island with spectacular and commanding sea views. If you are looking for luxury accommodation,then I suggest you are better off going to some crowded and stuffy 5 star hotel ! If you want cosy, glorious isolation and some serious relaxing down time , and maybe just 'do nothing- slowly ' then book in for a week (or more!) at the Old Schoolhouse on Dursey Island, Co. Cork, Ireland. Please see the 'Contact Us' page at the top for further details.